Close up view on her fitting form. 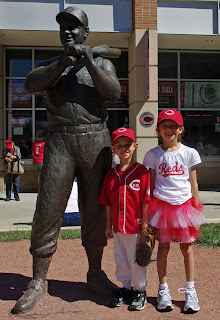 We getting ready to go see the Reds play baseball. Handsome Dude is all ready with his jersey (birthday present) and baseball pants (made by me). Curly was feeling a bit left out with nothing "Reds" to wear. She wanted a Reds shirt. 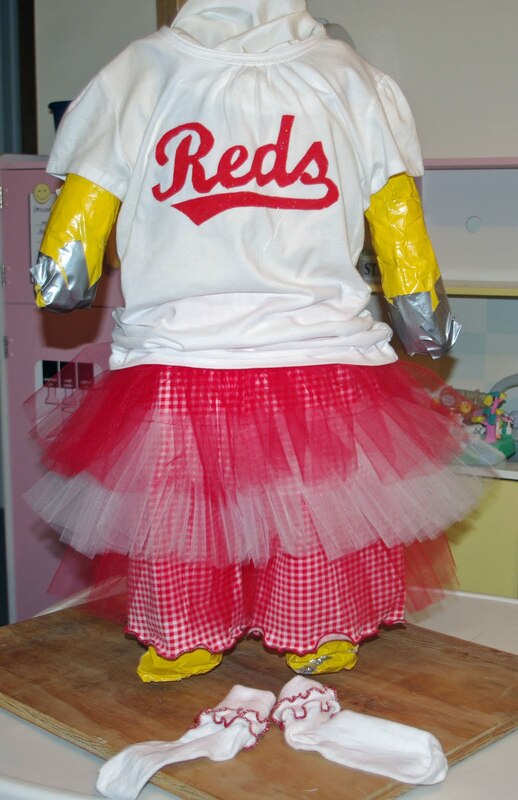 We weren't going to be near any stores with Reds apparel, and I didn't want to pay for a shirt that she'd wear just a few times. She suggested we make her an outfit. She wanted to help. This mama will take any opportunity to create with her little girl...so I took on the challenge. Sure enough google led me to a Reds logo that could be saved to my computer. From there we used a few of our past tutorials and created this outfit in just a few hours. The best part is "we". Ready to wear t-shirt that we had on hand. Logo from a google search "save as" to our desktop. Instead of using a cutting machine to create the stencil, print the logo onto the freezer paper (dull side) and use a sharp instrument to cut out the logo leaving the stencil. Lettuce Edge Tutorial (optional) I lettuced edged the bottom of the leg openings. I hope you enjoy some of these before school starts. You could even use some of these tutorials to create something special for school. I'm reorganizing the labels for the Tutorials. In the left hand column the tutorials are being listed in categories (Clothing, Accessories, Techniques, etc.) instead of one large group. This should make finding a tutorial of interest much easier.